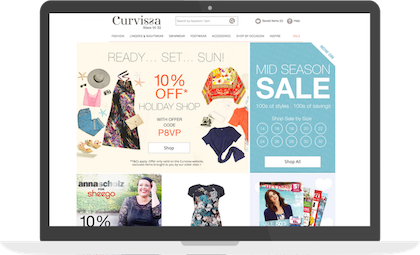 If you’re looking for stylish and affordable plus size clothing for women, look no further than Curvissa. They carry a wide selection of sportswear, casual wear, business attire, party dresses, and even maternity clothes. Plus, you’ll find lots of lingerie and swimwear, and they even carry shoes. The website also features lots of helpful information for finding the right look for you. These include a shape calculator, details on the current season’s hottest pieces, and a blog featuring helpful advice and the latest fashion news. Don’t let the name fool you — Dial a TV has much more than just flat panel screens that exist solely for your entertainment. You’ll find a great selection of refrigerators, washers and dryers, cookers, laptops, mobile devices, and of course, TVs and home cinema systems. With all the latest models and competitive prices, you can find everything you need to outfit your home with all the modern conveniences. 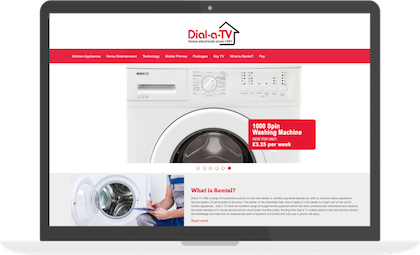 Dial a TV is a rent to own catalogue retailer. All of their products are priced by the week; as long as you keep up with your regular payments, your money goes toward the purchase of your items. After 39 months, the items you’ve been paying on will be owned by you outright. Great customer service is what Dial a TV prides itself on. All rent to own purchases come with free delivery, free installation, and free repairs. A kaleidoscope is able to create beautiful visuals using lots of small details working together. It’s this same principle that informs the fashion at the online shopping catalogue of the same name. “Designed to be different” is Kaleidoscope’s motto, and it’s easy to see why. All the little details, all the interesting fabrics, and all the bold colour combinations work together in Kaleidoscope’s fashion forward collection for the woman with discerning taste. Not only will you find the expected selection of separates, dresses, footwear, and more, all by top brands, but you’ll find speciality categories to help you find the perfect outfit for any occasion. Whether it’s the right dress to wear to a family wedding or a smart ensemble for your next big meeting at work, Kaleidoscope has you covered. Customers can pay upfront using a major credit card, or they can apply for a personal account and spread the cost of an order. With Kaleidoscope’s competitive prices, it’s easy to afford the great looks you’re after. French style has such an understated elegance. It’s cool yet calm, confident yet unassuming, contemporary yet classic. If you’re a woman who appreciates these qualities in her choice of clothing, you’ll love shopping at La Redoute. From casual separates to sophisticated evening wear, La Redoute has all the great looks you want at the prices you can afford. Men and children aren’t left out at La Redoute; there are lots of looks for the whole family to look their best. There’s also a homewares category, fully of interesting things for your home. And of course, they all have the same clean lines and same French flair as the retailer’s wardrobe items. Home delivery is just £3.99, and Click & Collect delivery is free. If you don’t like the way a piece fits, returns are also free. 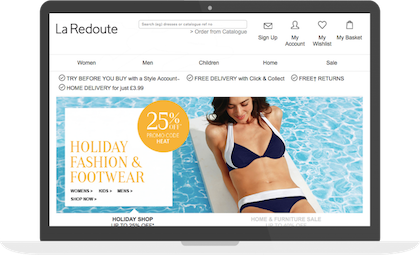 And, with a La Redoute Style account, consumers can spread the cost of an order. The key to successful catalogue shopping on finance is making your payments on time, every time. This keeps you in good standing with the retailer, potentially qualifies you for a credit limit increase, and could even improve your overall credit rating Remember, if you choose to spread the cost with your catalogue account it will cost you more than if you paid for the items in full. Catalogue accounts available to UK residents over 18 years of age. Credit is subject to affordability and status. Terms and conditions apply. Once you have found the items you want, you can apply for a credit account when you check out. You usually receive a decision instantly and be provided with a starting credit limit. Opening a credit catalogue account is subject to status and affordability checks and is available for UK residents aged 18 and over. Understand that paying for your order on catalogue credit means that you will pay more for your order than you would have if you had paid cash for it. This is the trade off for spreading the cost of your order over several months or years. All catalogues featured on this page offer pay monthly and sometimes pay weekly plans, allowing you to make repayments to suit your budget. For pay monthly catalogues, you will receive a monthly statement showing your current balance and amount you have to pay. There will usually be a minimum amount you have to pay (usually around 5%), although you can of course pay more to reduce your balance and overall interest. Payment plans vary for each retailer so make sure you check the terms and conditions carefully. A number of catalogues offer Buy Now Pay Later (BNPL) payment plans which allow you to get the items you want now and start making monthly repayments at a later date (usually 3-12 months). Catalogues which do not offer Buy Now Pay Later, usually request your first payment a month after you have received your shopping. Catalogues which provide this option can be harder to get approved with. When applying for a catalogue account, a credit check/affordability check will be performed to ensure you can afford the minimum repayments and also to determine your identity. If you have bad/poor credit history or have not yet built a credit rating, your application may be declined. Each catalogue have their own credit criteria; so if you have been rejected by one company, it does not mean you will be rejected by them all. How can I apply for catalogue credit? The process of applying for credit varies from catalogue to catalogue. With many online shopping catalogues, you can apply right on the website by entering your information. The site will quickly run a credit check based on the information you provide, and you should know if you’re approved or not approved rather quickly, usually within a minute or two. What do I need to know about placing my first order? 1. Keep your order value low, since you may not qualify for a high line of credit as a first time buyer. Under £100 is definitely recommended, but to really improve your chances of being approved (especially if you have a poor credit rating), keep it under £100. 2. Take some time to familiarise yourself with the shopping catalogue’s delivery and return policies. Many will ship your order right to your door for under £5, but some charge more. You don’t want to be surprised with a large delivery charge. Also, make sure you can return an item if it doesn’t fit or is not as you expected. Many catalogues have a two week return policy, but it’s important to confirm this type of information before making your first order. 3. Look for first time buyer discounts. Many retailers, in an effort to bring in new customers, will offer 15%, 20%, or even 30% off a first personal account order. These discounts will often be advertised on the catalogue website’s homepage. However, to actually get the discount, there is often a code that you must enter. If you forget to enter it, you forfeit the discount. The amount of credit you are eligible for depends on your credit rating and how long you have been a customer with a particular shopping catalogue. The higher your credit rating, the more credit you’ll have extended to you for your first order. Similarly, the longer you are a customer in good standing with any given shopping catalogue, the more likely your credit limit will increase. First time buyers with any catalogue should not expect to be given a line of credit that’s much more than £100 or £150. However, once you start making regular payments on your account, you can expect to see that number go up, meaning that you can place bigger orders in the future. Where can I find a copy of my credit report? While it would seem like the reports from all three agencies would be similar, mistakes do happen when lenders report credit standings and issues. Therefore, it is highly advisable that you check your credit report from all three. Dial a TV – Since this is a rental company and not a catalogue that provides credit, Dial a TV can be more flexible to customers who have a low credit rating. Payments are spread on a weekly basis. In the event that you no longer pay for your rented item, you can simply return it. • Pay off your debts. If you already have a lot of debts that you need to pay, many lenders may be wary of giving you more credit. • Make all of your payments on time, and try not to pay less than the minimum required. This shows lenders that you are a responsible consumer who makes good on financial commitments. As a bonus, you could avoid paying late fees and extra interest. • Make sure you are on the electoral register. Many lenders will cross reference this information for identification validation purposes. • Close accounts that have a zero balance. If you’ve already got credit that you’re not using, some lenders may not wish to give you more credit for fear that you won’t use it. • If you notice mistakes on your credit report when you check it (which you should do on an annual basis), contact the credit reporting agency or agencies to have errors fixed. These can have a big negative impact on your credit report. • Don’t move a lot. While moving to a new home may be unavoidable in some cases, having the same address for several years at a time indicates to lenders that you are a stable person, both in home and, by extension, in finance. • Just give it time. Strikes on your credit report stay there for six full years. Even if you have been financially responsible and making all of your payments on time for five years, the activities you made six years ago are still very much a part of your report. However, time heals all wounds, as the saying goes. Eventually, those black marks will be taken off your rating, leaving you with much better credit history. How do I make catalogue payments? The process for making payments on catalogue personal accounts will vary from one retailer to the next. You will receive a regular statement showing your purchase history, total balance currently owed, and a minimum payment amount. The typical minimum monthly repayment is around 5% of the balanced owed. For example, it you purchase a television, which costs £1,000, your monthly payment would be around £50. It is important to read the payment terms carefully upon placing your order. Payment options vary but can typically can be made by credit/debit card, direct debits, cheques, bank transfer or via a post office.